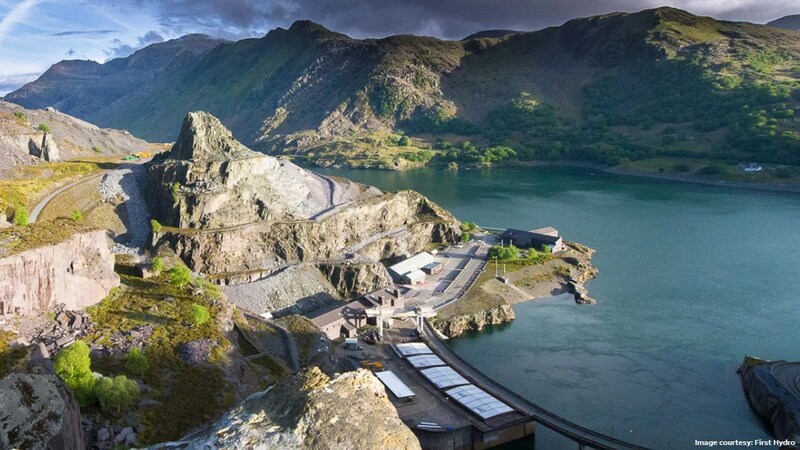 When the Dinorwig pumped storage power plant was first built in 1984 in North Wales, it was hailed as one of the world’s most innovative construction projects. In order to preserve the natural beauty of the Snowdonia National Park, the power station is built deep inside the Elidir Fawr mountain. It now hosts a visitor center, known as Electric Mountain that gives public access to some of the 16-kilometers of underground tunnels inside the mountain. In a pumped storage power plant, water is pumped up to a higher level, for instance the top of a mountain and stored in reservoirs. When needed, the water is released and used to generate electricity. Operated by First Hydro Company*, the Dinorwig power plant is the fastest pumped storage installations of its kind, capable of reaching maximum generation of 1'728 megawatt (MW) in less than 16 seconds. It is also the largest installation of its kind in Europe. During low demand, water is pumped from the lower reservoir in the valley up 520 meters to the higher reservoir and stored, ready to be release during peak demand period, in order to generate electricity quickly. The plant is capable of providing continuous power to 3 million people in Wales for five-and-a-half-hours. The original generator circuit-breakers (GCB) at Dinorwig from ABB have been protecting the power plant for over three decades, ensuring continued safety and reliability. ABB will replace the existing equipment at Dinorwig with the latest state-of-the-art GCB technology as part of a high-voltage service contract. The GCB protects key equipment such as generators and transformers by clearing potential harmful short-circuit faults to prevent severe damage and possibly lengthy plant downtime. Integrated in the GCB is an innovative monitoring system solution, based on GMS600, enabling ABB AbilityTM Asset Health for GCB to support First Hydro Company with online asset management of the equipment. “ABB’s generator circuit-breakers have been protecting Dinorwig for over thirty years, and our technology will continue to secure the reliability of the power plant for decades to come”, said Markus Heimbach, head of ABB’s High Voltage Products business unit, within the company’s Power Grids division. “We are pleased to continue to support First Hydro Company in their modernization efforts to increase plant reliability. ABB offers the widest and most modern portfolio of GCBs in SF6 and vacuum technology across a range of short-circuit ratings, from 50 kA to 300 kA and nominal currents from 3,150 A to over 50,000 A to meet the demand of all types of power plants around the globe.